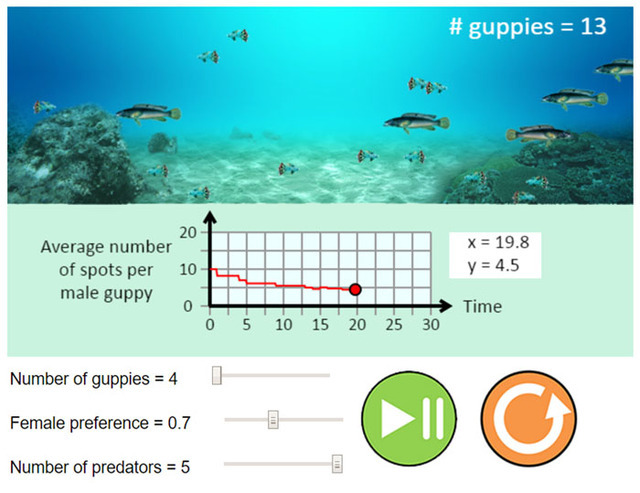 The Sexual Selection in Guppies virtual laboratory simulates John Endler's 1980 classic experiment with guppy fish demonstrating the balance of sexual and natural selection processes. In guppies, females prefer to mate with males that have lots of spots, but those males are more easily seen by predators. In the virtual lab you can manipulate the strength of female preference for spotted males, the number of predators, and the initial number of guppies. The result is a graph showing the trend in the average number of spots per male guppy over time.